How living 5,000 miles from home in a Hindu school in rural south India made me feel more Jewish than ever before. At age 19, I signed up for a cultural immersion program teaching English as a volunteer in India. I felt, at age 19, prepared for my travels to India. My confidence came, in part, from having studied Hinduism in high school. In the UK, where I was raised, religious education is compulsory and multifaith. Years of this religious education opened my eyes to other cultures. Class trips to pagodas, temples, churches, and cathedrals enriched my education and cultural awareness. The hallmark of my high-performing girls’ school was producing women who didn’t just think we could do anything, we knew we could—and I was no exception. Nothing, however, prepared me for how my Jewish identity would alter during that trip to India. 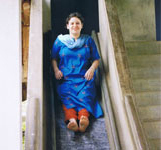 The immersion turned out to have minimal structure once I arrived in India. Unlike other programs, we were not housed in groups, nor guaranteed of any particular experiences. Making matters worse, the manager of the program had a terrible alcohol problem and an evangelical Christian bent. (The other staff members, who were good, all quit as the manager’s drinking got worse.) I had the mixed blessing to be the only teaching volunteer placed in a rural school just outside of Bangalore. I was alone; however, the generous director of the school realized the problems with the program organization and took me under his wing. He allowed me to live in a separate bedroom in the apartment that housed the school’s three female teachers, and he fed me as well. I will never forget my first night at the school. After dinner, my newfound colleagues (and roommates), traditional Indian young women from another village, were keen to welcome me. They invited me to join them in a traditional Indian hug, and I had never been held so tightly in my life, let alone by strangers. Then, they started to pray fervently. After some rapid talk in a language I did not understand and scrabbling for words, they explained to me that they were praying, and invited me to pray too. And so on, testing the various gods’ names; “Shiva?” “Ganesha?” All meeting my negative response. Again some rapid conversation in the strange language (I learned later it was Telugu), and then they argued, I presume, about what to ask me. One teacher finally declared, “i am knowing,” she said. “You god Yesu?” (the Indian name for Jesus). My new colleagues were certainly more confused by my religion than I was by theirs. Over the course of my stay in India, I would discover that I, too, was confused by my own faith. I soon settled into school life and found myself happy, visiting families in the villages and teaching. Yet I was also profoundly lonely—a teenager away from home and in a village where no one spoke my language. I found solace in my weekly trips into the bustling metropolis of Bangalore city. In a small Internet café, with three individual computer booths, I printed out the Shema in English and Hebrew. I didn’t know what I would use it for, but it felt important. Having arrived without a siddur did not mean I was a secular Jew. I had intentions to eat “kosher” in a vegetarian sense, and not to travel on Shabbat. I had a deep and abiding faith in the Jewish G-d of my childhood, but my faith was tempered by a mild embarrassment that had grown out of a lack of Jewish education. There I was, age 19, a straight-A student headed to Cambridge University, with the Jewish knowledge and education of an elementary school pupil. The differences between my Jewish and secular education became starker during my stay in India. The experience of being the only Jew—and, indeed, the only westerner within a 45-minute drive—was profoundly new to me. I also felt so lonely—surrounded by people all the time, yet no one understood where I came from, my cultural assumptions, or simply my way of just being. Surrounded by temples and symbols of foreign gods, I cried, talked, and prayed to the G-d I had known since my childhood. Rushing, with tears in my eyes, I said the Shema—not once, but repeatedly—in the morning, and again during my tea break. It was a level of piety and connection to G-d I had never reached in England. Doubtless this was not the halakhic (Jewish legal) formula for tefillah (prayer). Doubtless G-d knew what I meant. And so it was that I found my Judaism in India. I finished teaching and went travelling, met an atheist neuroscientist, and realised all over again how little I knew about my own religion. I was forced to ask myself what it meant to me to be Jewish, which in turn made me want to learn more. Six years down the line, a literate, educated Jewess, taking my rightful place within my heritage, I maintain something of my travels in India. I feel Jewish from the inside, whether I am leading a social justice project, attending synagogue, or participating in something someone else is leading. I am undeniably a part of the Jewish community, practising and involved in a myriad of ways. That said, living in another culture made me miss, love, and cherish Judaism by seeing it from the outside. I am happy and blessed to be able to maintain a strand of that critical awareness, and to be able to integrate it within my insider’s Jewish life.